Fishing the Pacific Northwest's rivers for Salmon and Steelhead is the core of our business. The primary rivers we fish are the Skagit, Sauk, Stillaguamish, and Skykomish. If you are looking for a Colombia River Fishing Guide, we offer trips during peak fishing times for King Salmon, and sturgeon as well as the Lewis river for Spring Kings and Summer Run Steelhead, and the Cowlitz for Winter Steelhead. Check out our Best Fishing Times page for our yearly fishing schedule. The Olympic Peninsula also has some incredible fishing opportunities on rivers such as the Bogachiel, Hoh, and Sol Duc. Having spent many years behind the oars on these streams, it is always a treat to share the experience and thrill of fishing the coastal rivers. Looking for a trophy King or Steelhead? Don't let the term "stream" trick you, The OP rivers are known for putting out some monster fish. Of course all fishing gear and bait is provided. We use only high Quality gear such as Gloomis, Lamiglas and Shimano. Primarily we use a 22 foot Fish- Rite jet sled for larger rivers and a 20 foot Koffler drift-boat, which provides comfort and an excellent fishing platform. I often free drift or float fish with three clients in this boat and have had many complements on the lay out of the boat, and the amount of room that it affords for a drift boat. For smaller rivers or fly fishing trips we use a 17 foot Hyde, with dual fly stands. All of our Boats have propane heat for your comfort, and large fish boxes eager to be filled. We pride ourselves in giving exceptional service to our clients as well as consistently catching fish and providing a quality experience on the river. 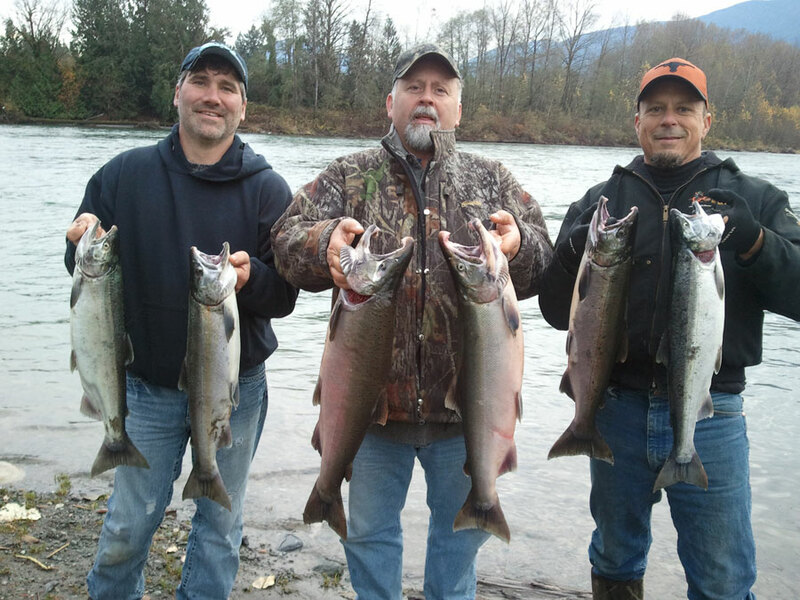 Skagit River Guide Service is a fully licensed and insured business and Pro guide Wayne Ackerlund has 15 years experience as a full time guide in Washington State. Although the Skagit is our home river, we are on the road often chasing fish elsewhere in the state and always willing to set up custom trips for clients as well as put together corporate outings. We co-op with many other guides in Washington State and can accommodate large groups, as well as handicap.